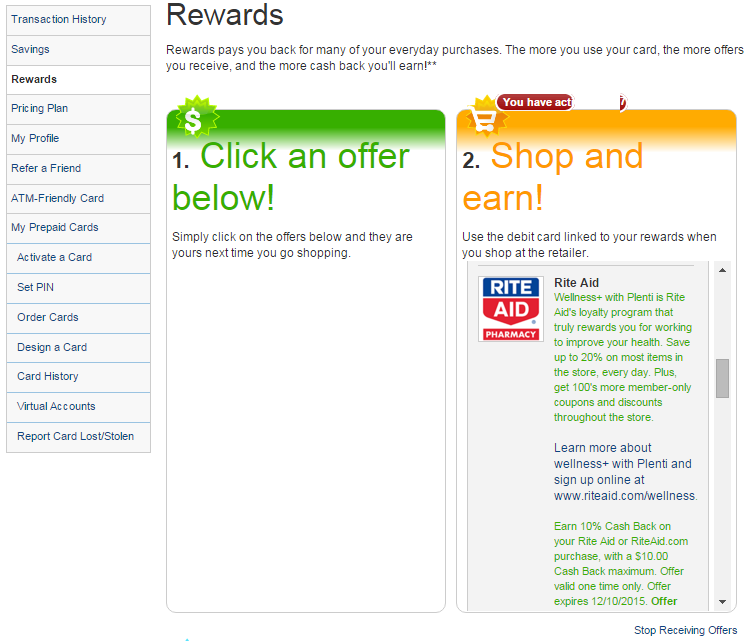 Earn 10% Cash Back on your Rite Aid or RiteAid.com purchase, with a $10.00 Cash Back maximum. Offer valid one time only. Offer expires 12/10/2015. Offer not valid on prescription purchases, tobacco, alcohol, lottery, gift cards, cigarettes, licenses, money orders, money transfers, prepaid cards, stamps, or other mail services. It says, “offer not valid …. gift cards …. prepaid cards.” But, I doubt that they can tell if you buy gift cards or prepaid cards because transaction history shows the only amount, date, and place. Here is an example, a transaction at Walmart. Most of the amount is cash back, but the history doesn’t show that. Besides, I have received the Kmart rewards in that way. Here is my plan. First, find out how much I can get cash back at a register. I will make a small purchase with other debit cards. I have many reloadable prepaid cards to liquidate, WM money card, GoBank, Mango, etc. PIN pad shows how much you can ask for cash back. The largest amount a PIN pad shows, I will consider it as maximum amount although you may press “other” and ask for more. And then, pick a gift card and choose an amount that will be at least $100 when it is added maximum cash back. In this way, I will be able to get more than 10% cash back deal! I hope things are going well. Update 11/23/2015, my in-store purchase of third party gift card successfully reflected towards payback rewards! They have a great selection of gift cards, department stores, gas, eBay, Target, etc. My first plan was to find out how much I can get cash back at the register by using the other debit card. But thanks to R’s comment, I assumed it was $40 and skipped this step. I picked up variable Target GC and asked to load $60. PIN pad showed $10, $20, and $40 for cash back, and I pressed $40. I happened to know that they offered Plenti points for the purchase of some gift cards this week. If you consider earned Plenti points as a cashback or discount, you can make a profit by reselling. For example, GCs of Nike, Chili’s, and Carte&Barrel will do. I have earned $44 in Plenti points that can be redeemed for the future purchase at Macy’s, Rite Aid, Exxon, Mobile, etc. This is my first time to buy gift cards at Rite Aid. I didn’t know they offered such great deals. And I don’t know how often they do, but I should check their weekly ad from now on. Thank you for the information. My local store allows $40 cash back as well.